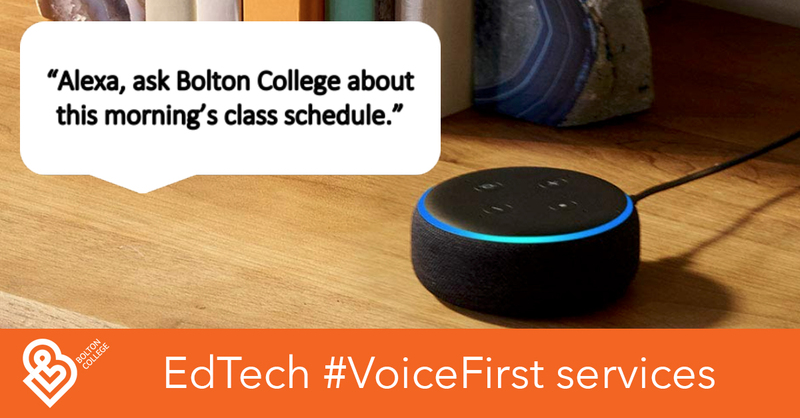 Voice First offers schools, colleges and universities an exciting opportunity to deliver their services through ambient devices such as Amazon's Echo smart speakers. When students are able to authenticate to these devices they can illicit information that is personalised and contextualised to them. Imagine a student at home who turns towards her echo device and asks about this morning's schedule of classes; the date, time and location of a forthcoming exam or she may use the service to send a message to one of her tutors. In some instances, the voice first service may respond with information, advice and guidance beyond the initial enquiry. For instance, when a student asks about the deadline for a forthcoming assignment, the voice first service may also advice the student about her target grade or it may offer workshop details associated with this particular assignment. This is the most compelling aspect for individuals who use these services. The nature of these services make them function and behave very differently from traditional services which typically send out push notifications or reminders to you. Overtime, these voice first services will invariably develop a greater degree of agency as they act on behalf of teachers and support teams on the campus; and as they support students from enrolment through to graduation. Previously, I mentioned that students, teachers and support teams seek immediacy. They expect information to be delivered to them quickly and they expect to carry out routine tasks and activities with little or no friction. The	advent	of	voice first services enable schools, colleges and universities to meet this need. In a recent LinkedIn post, my colleague Dean Baggaley, demonstrates how account linking can help students garner personalised and contextualised information from their Alexa devices. We look forward to publishing this Alexa skill in the near future so that it may benefit our students at Bolton College. The chatbot at Bolton College is built on IBM's Watson Assistant platform. The platform is linked to the college's business intelligence and software development layers which enable the chatbot to connect seamlessly with other platforms, devices and services; such as the Alexa Echo smart speaker. With the support of the Ufi Charitable Trust, Bolton College is also about to start a project which will enable students, teachers and support teams to access the campus chatbot via their iPhone and Android smartphones. This is another example of a voice first service were students simply have to talk to their smartphones to garner information about the college or their studies.